Monophyllaea horsfieldii produces a single large leaf (= macrocotyledon) atop a sturdy stalk (= hypocotyl). The flower inflorescences emerge from the leaf surface near the point where the hypocotyl attaches. In this small group of mainly SE Asian plants, each genus exhibits its own strange morphology. The most peculiar genus of this alliance is Monophyllaea. Plants of this Malesian genus consist of a single, huge foliar organ (macrocotyledon), and a long stalk (hypocotyl). The plants thus comprise the same elements as the unifoliate species of Streptocarpus. However, apart from the obvious difference of the elongated hyopcotyl, there are strong differences in the formation of the inflorescences. While in Streptocarpus the inflorescences are produced in a single series in the axil of the macrocotyledon, those of Monophyllaea form characteristic aggregates, in which the individual inflorescences (pair-flowered cymes with an usually long peduncle) emerge in an alternate sequence, forming two ranks in an almost distichous arrangement. The peduncles are associated with tiny bracts at their base, which represent the subtending bracts of the inflorescences (Weber 1975a). From the species arrangement of the bracts and the axillarly cymes it can be inferred that the ancestors of the genus must have been a Whytockia-like plant (Weber 1976b). Indeed, recent molecular analyses show that Whytockia and Monophyllea are sister genera (Mayer et al. 2003). Monophyllaea singularis from Borneo produces its tiny flowers along the stalk (mesoocotyl) and sometimes on the mid-rib of the single leaf macrocotyledon. Perhaps the most peculiar species of Monophyllaea is M. singularis from Borneo. 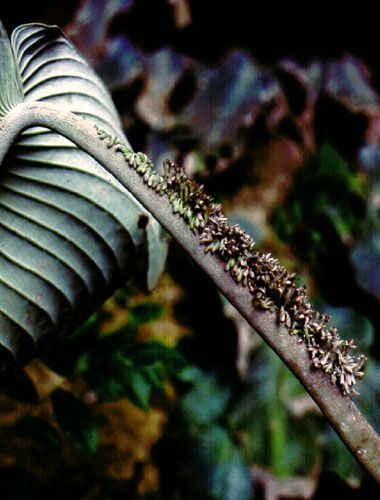 In this species the flowers are arranged in numerous tiny groups along one side of the stalk and sometimes also along the midrib of the macrocotyledon. Here a mesocotyl (secondary, intercalated internode between the micro- and macrocotyledon) is formed like in Streptocarpus. The flower groups are produced on one side of the mesocotyl in a most peculiar manner: mature epi- and hypodermal cells divide secondarily and form meristematic spots from which the flower groups emerge (Weber 1990; Imaichi et al. 2001). The groups correspond to the inflorescence aggregates of other Monophyllaea species, but comprise only few and epedunculate cymes with few flower pairs. Also noteworthy are some Monophyllaea species which produce several leaves and exhibit a kind of phyllomorphic structure (Burtt 1978). 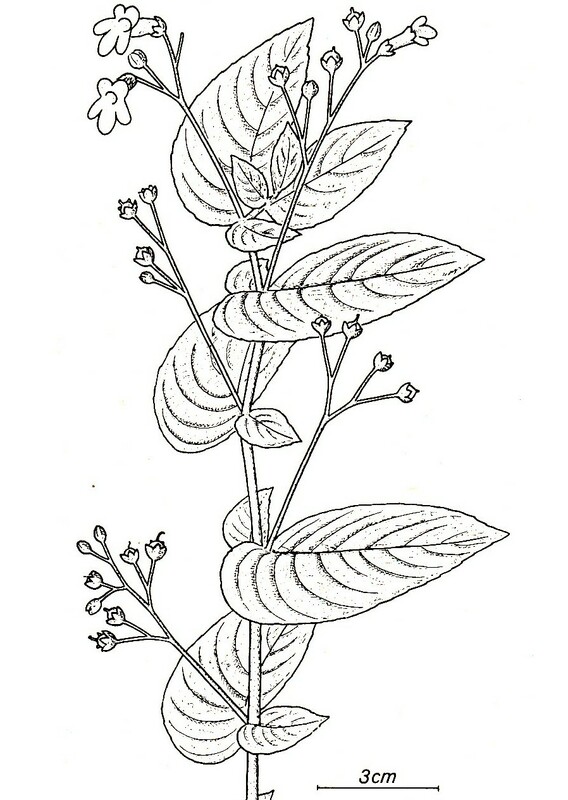 Flowering plant of Whytockia sasakii (redrawn from Kao & DeVol 1972). Note different size of the leaves in the leaf pairs, and pair-flowered cymes emerging exclusively from the axils of the larger leaves. Whytockia is a small genus of S. China and Taiwan. It is a rhizomatous plant with aerial shoots. The shoots bear pairs of strongly asymmetrical leaves which are, however, very unequal. One is a normal foliage leaf, the other reduced to a small but still leaf-like structure. The leaves alternate and fall roughly into a single plane. The inflorescences (unbranched, pair-flowered cymes) emerge only from the foliage leaves. By the alternate arrangement the leaves form two ranks. For details and phylogenic considerations (close relationship with and morphologiclly ancestral form of Monophyllaea) see Weber (1976b). 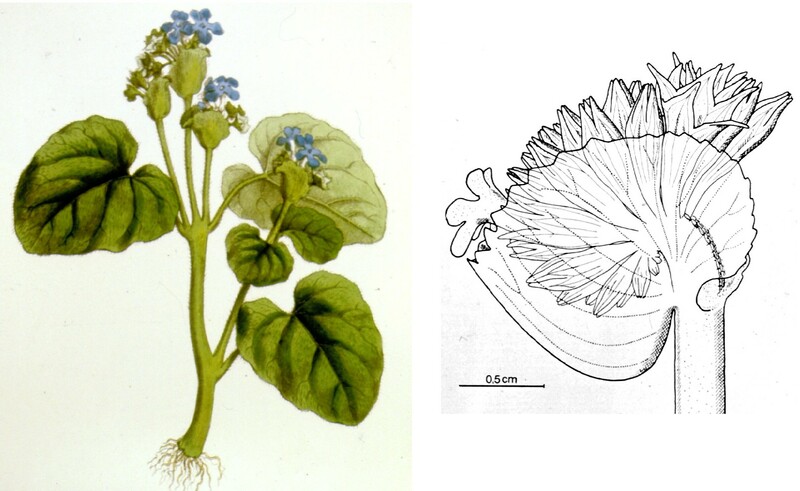 Left: Flowering shoot of Loxonia hirsuta (Borneo) Right: Diagram of shoot architecture of Loxonia. 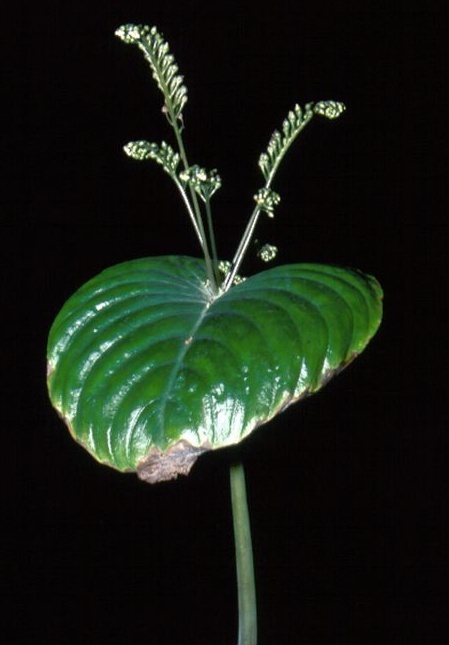 The flowering shoot is composed of shoot units (paracladia, Pc), each comprising an anisophyllous leaf pair (+/-) and a terminal inflorescence (florescence, F). The latter is made up of (1-)3(-4) partial florescences (PF) = cymes. From Weber 1977. Similar in habit to Whytockia are Loxonia and Stauranthera. In these genera the inflorescences, however, do not emerge from the axils of the large leaves, but stand opposite and seemingly emerge from the axils of the rudimentary leaves. Closer analysis shows that they represent terminal and complex structures, comprising two to several pair-flowered cymes in alternate position. The whole flowering region of Loxonia and Stauranthera is composed of sympodial units, each comprising a strongly anisophyllous leaf pair and the terminal complex inflorescence. 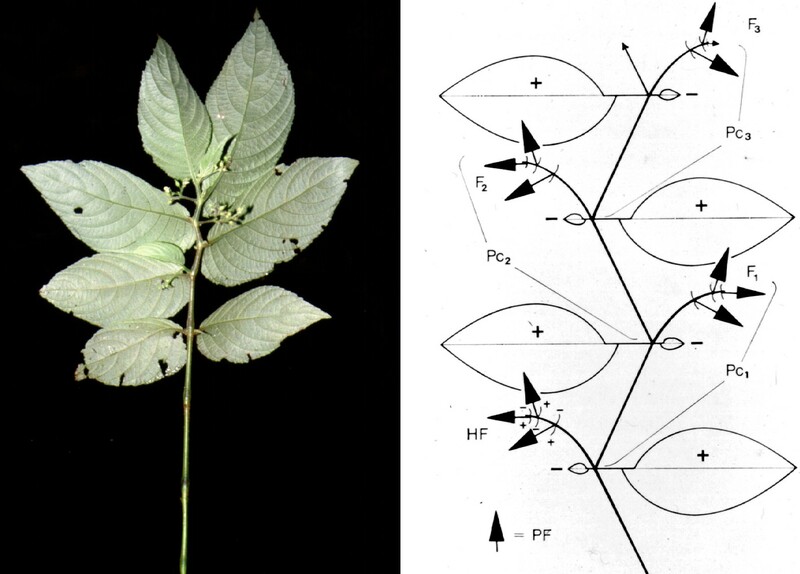 By the growth of the subsequent units, the terminal inflorescences are bent to the opposite side of the large leaves (Weber 1977). Rhynchoglossum notonianum has entirely lost one leaf of each leaf pair. 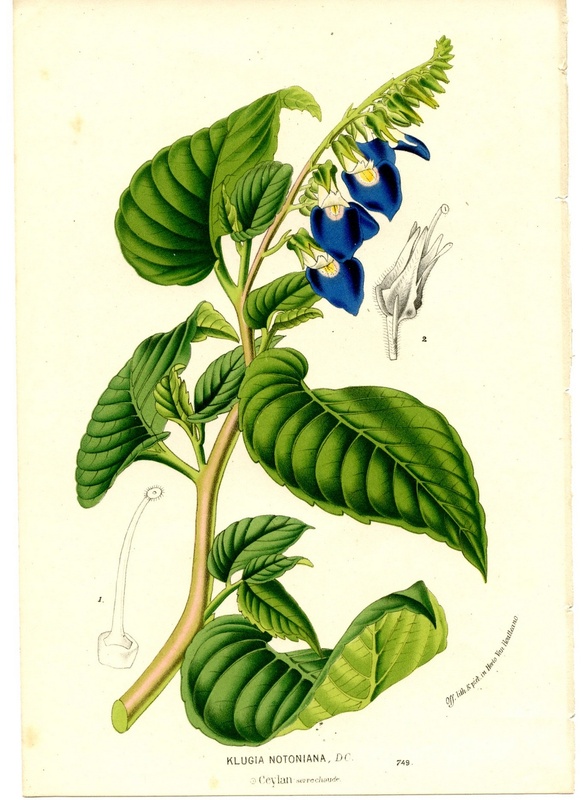 This results in an alternate-leaf arrangement as can be seen in this print from Hortus Van Houtteanus (1832; as Klugia notoniana). In Rhynchoglossum, anisophylly has proceeded to its extreme: the small leaves are completely reduced and only the strongly asymmetrical foliage leaves remain, being placed in two almost opposed ranks. As in Loxonia and Stauranthera, the inflorescences are terminal, but the cymes are reduced to single flowers. This results in unilateral racemes with two flower rows (Weber 1978). Apparently in compensation of the reduction of the cymes to single flowers, flower number may increase by elongation of the raceme (e.g. R. obliquum). The genus Epithema is unique in several respects. Above the strongly unequal cotyledons (placed at the very base of the plant and decaying soon) a single foliar leaf is produced recalling an additional macrocotyledon. This is followed by one to several opposite pairs of ± equal and ± symmetrical foliar leaves. The stem and the axillary shoots are terminated by an inflorescence consisting of a globose “head” (an extremely contracted pair-flowered cyme) subtended by a small or large, cucullate bract (Weber 1976b). This peculiar type of inflorescence is probably derived from a more elaborate type with several lateral flower heads (as found, for instance, in Monophyllaea wildeana), which has been reduced to a single head and its subtending bract (Weber 1988). With respect to the vegetative region, Bransgrove and Middleton (2015) say in their revision of Epithema, that some species do not conform with the architectural pattern described above. Studies on a taxonomically broad basis are apparently needed to clarify the matter. Left: Epithema involuctratum, typical habit of an Epithema plant (from Wallich, Plantae Asiaticae rariores, t. 288 (1832, as Aikinia brunonis). Right: Top of inflorescence of Epithema carnosum; note subtending cucullate bract and dense aggregation of of the flowers in the pair-flowered cyme. From Weber (1976b). The last genus of the alliance is the ill-known Chinese genus Gyrogyne (monotypic with G. subaequifolia). Because of the plicate calyx it is said to be closely related to Stauranthera. Its subequal leaves may represent an ancestral condition to the strongly unequal leaves of Stauranthera.